Wish to Purchase First Special Grade (FSG) Castor Oil from India? Castor oil FSG is produced by refining commercial grade castor oil using bleaching and filtering processes. What Can We do for Your FSG Castor Oil Sourcing Requirements? CastorOil.in provides quality assistance, especially for international companies, in procuring FSG from high quality suppliers in India, who are also excellent in customer service and support. CastorOil.in does not charge the international buyer for its services. 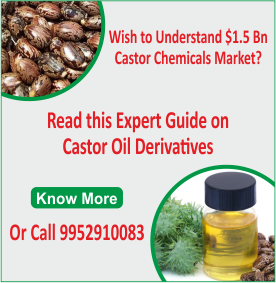 in is the world’s only dedicated online guide for the castor oil and castor oil derivatives sector. We have been in existence since 2006, and are well connected to the entire castor oil business value chain in India. We specifically work with both small and large companies in India’s castor oil sector. In addition, CastorOil.in publishes the only industry wide guide and report for castor oil, the Comprehensive Castor Oil Report. Please Note: We cater only to bulk requirements, with a minimum order quantity of 1 container.